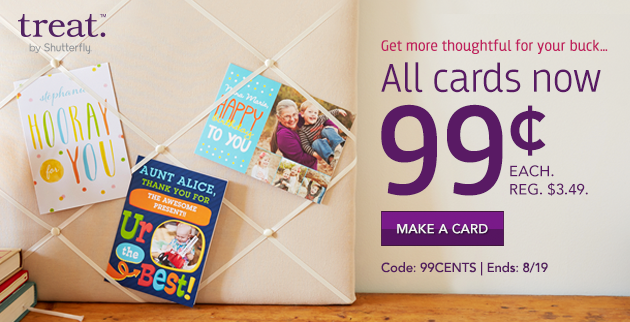 Treat Unlimited FREE Digital Cards – 2 Days Only! Treat is offering unlimited digital cards for FREE! Yes, unlimited and free in the same sentence! Create and send as many digital cards as you want for 2 days, as well as use the ‘schedule ahead’ feature. There is no promo code required – All digital cards will be priced at $0! Ends at midnight Pacific Time on 8/4. Start the new year off with this FREE eBook that will help you feel better about yourself in 31 days! The eBook is roughly 12 pages – an easy tackle! Free Shopcade Membership – where you create a personal store that features products from a catalog of over 40 million items and save up to 70%. AboutOne – a FREE online organizer can help you get organized and not worry about where you put that paper or asking yourself – what time was I suppose to be there? Or saying, I will have to look when I get home. Sign up for AboutOne and manage all your household information for free online. If you don’t like the platform – you’ve lost nothing because it’s FREE. Ladies Home Journal -Signup to get 11 free digital issues! There’s nothing like adding to your collection of eCookbooks. Here’s another FREE Mr. Food Everything Easter eCookbook for downloading. Enjoy! Free Brownie Recipe eBook – Yum! Summer is coming – vacation time will soon be here for many. Would a trip to Alaska be a destination option? Grab this FREE Official State Guide Book to learn more (please don’t tell my daughter about this…she wants to go where Polar Bears live).